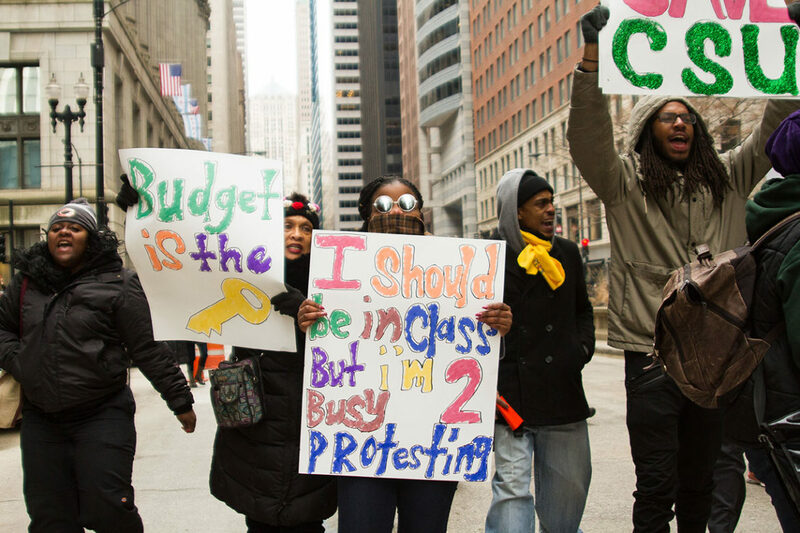 Chicago State University students march downtown on February 8, 2016, protesting Gov. Bruce Rauner’s failure to pass a state budget and jeopardizing the future of CSU. The recent higher education bill that sent $600 million in stopgap funding to public colleges and universities will keep them afloat for the next few months. But with long-term state funding still held hostage by the ongoing budget crisis, deeper problems with college access and affordability remain unsolved for low-income and first-generation students of color, who depend most heavily on state aid and publicly funded universities. These cuts threaten the progress that Chicago and Illinois have made in getting more of these students into college and earning degrees. The percentage of Chicago Public Schools graduates who enroll in four-year colleges has risen steadily in recent years and, though still lower than the national average, is now at 59 percent, according to CPS data; 72 percent of those graduates end up at a public college or university. Meanwhile, data from the state show that the number of black and Latino college graduates in Illinois increased substantially between 1996 and 2014: black graduates rose by 83 percent to nearly 8,000 students, while the number of Hispanics earning degrees nearly tripled to about 7,000. High school counselors are seeing the impact first-hand. At Hope College Prep in Englewood, Lindsay Brown has spent the past three years trying to build a culture that helps students in the impoverished community believe that college is a viable goal. Now, her students tell her they’re looking to two-year institutions instead—or worse, giving up on the idea of college altogether. 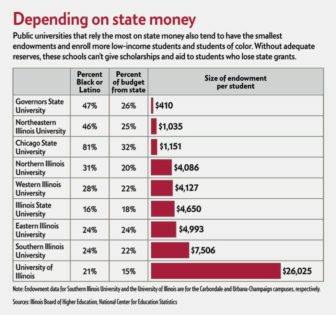 According to the Illinois Student Assistance Commission, more than half of black and Latino undergraduates at the state’s public universities receive MAP grants. Among all students who receive MAP, 57 percent are first-generation college students. MAP grant funding fell to just $170 million in the stopgap bill — less than half the amount spent in 2015. Lower-income and first-generation students of color take a double hit: Not only are they more dependent on state grants to pay for college, but the schools they’re most likely to attend have much smaller reserves and endowments. That means fewer scholarships to buffer the loss of state grants, as well as fewer services and staff to provide support to make sure students stay on track to graduate. 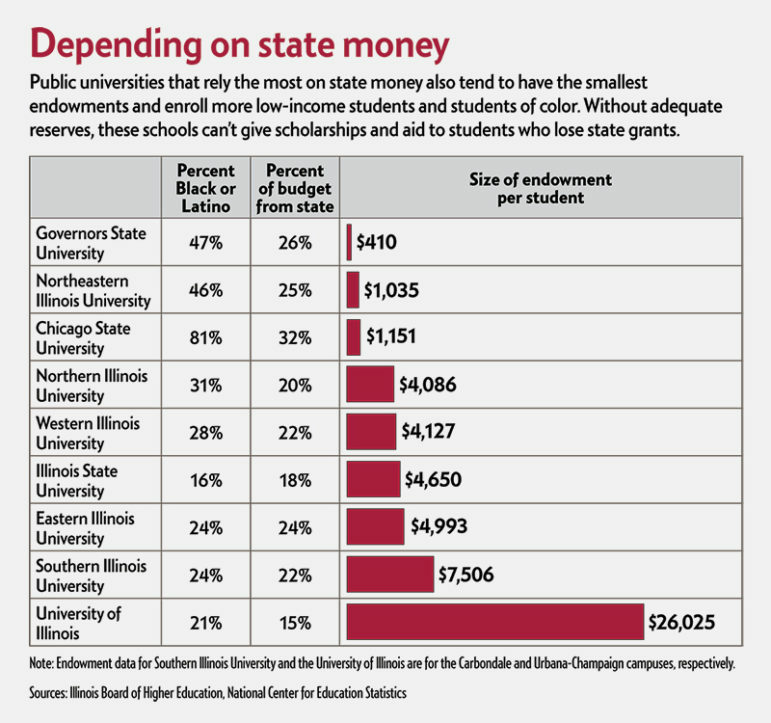 A case in point: Chicago State University, which was forced to lay off 300 workers despite the last-minute bailout bill, depends more heavily on state aid than any of the other eight public universities and has the third-smallest endowment for its student size. Nearly a third of Chicago State’s revenue came from the state last year– more than twice the percentage of the flagship University of Illinois system. Chicago State is 74 percent African American and 7 percent Latino, while black and Latino students make up a combined 21 percent of students at U of I’s three campuses, according to 2014 data from the state. High schools counselors are already noting a decline in scholarships. Jennifer Ciok, a specialist at Sullivan High for the Umoja Corporation, a non-profit that partners with schools to increase graduation rates and offer other support to students, wonders whether universities are being more cautious because of the uncertainty surrounding higher education funding. 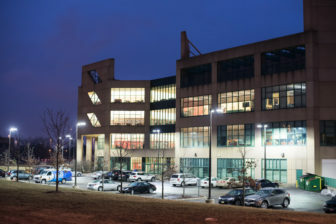 Jim Palmer, an Illinois State University professor who has studied higher education funding for more than two decades and produces an annual national report on the issue, says state flagship universities have stronger graduate programs and are better able to attract top-ranked research faculty who can garner multi-million research grants. But Marybeth Gasman, who directs the Penn Center for Minority Serving Institutions at the University of Pennsylvania, sees bias at play and questions why states have historically bypassed institutions that serve mostly students of color when deciding where to place flagship programs and research facilities. Chicago State University awarded 16 percent of all the degrees earned by black Illinois students at public universities in 2014. Gasman says the trend is especially troubling because institutions like Chicago State graduate a disproportionate share of African American students: Only about 3 percent of all black undergraduates in Illinois public universities were enrolled there in 2014, but Chicago State awarded 16 percent of all the degrees earned by black students that year. “Chicago State is doing the lion’s share of the work with regards to low-income African-Americans, and African-Americans that are returning to school,” Gasman says. Brenda Hernandez, a graduating senior at Northeastern Illinois University, knows she’ll never be able to give millions to the school. As an undocumented student, she was not eligible for needs-based financial aid from the state or federal government and had to pay her own way through school. Now, she tries to support alumni association efforts, including a campaign to get seniors from the Class of 2016 to donate just $20.16. “I see their efforts and what they try to do and how much help they don’t get,” she says. More than half of applicants for Illinois’ Monetary Award Program, which helps poor students pay for college tuition, were turned away in the 2016-17 school year due to a lack of state funding. Deep cuts to higher education are pushing black, Latino and other first-generation college hopefuls out of a path to upward economic mobility, a new report shows. Ala’a Basatneh, aka #chicagoGirl, uses social media to coordinate protests driving the Syrian revolution.